First, learn to blend colorful sheets of polymer with a painterly flair! Then build the sheets into ‘canes’ that interlock with each other. And finally learn to manipulate these canes into a myriad of rich colorful patterns. We will use the canes as veneers on at least 4 different bead shapes. The class includes all sorts of tips on color mixing and blending, forming repeat patterns, techniques for low distortion in reduction and other useful caning techniques. I prefer Classic FIMO, but most brands work… In descending order I would choose, Kato, Premo, Fimo soft, Cernit. Sculpey tends to be a little too soft for the caning process. Skill level: all levels, but remember you do need a pasta machine. 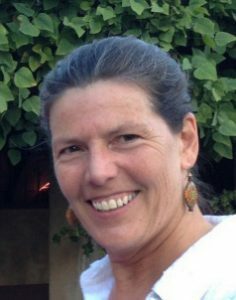 Sarah Nelson Shriver is an accomplished polymer clay artist and teacher who graduated from the University of California at Davis in 1983 with a bachelor’s degree in art. 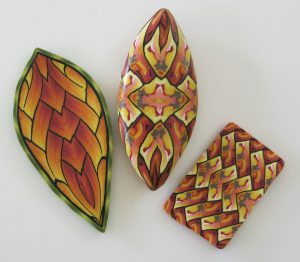 In 1986 she was employed in a fabric and art supply store in San Francisco where she first began working with polymer clay. 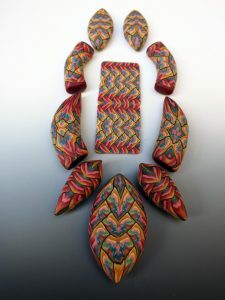 Since 1989 she has been working full time out of her home/ studio in San Rafael, CA, using the mille fiori, or caning technique to make intricately patterned beads, buttons, and jewelry. Her background in textiles is evident in her designs, which were described in an Ornament Magazine review as “meticulous, delicate, and elegant”. Sarah has been recognized as a pioneer and master of her craft and has participated in a number of juried and invitational exhibits and shows.